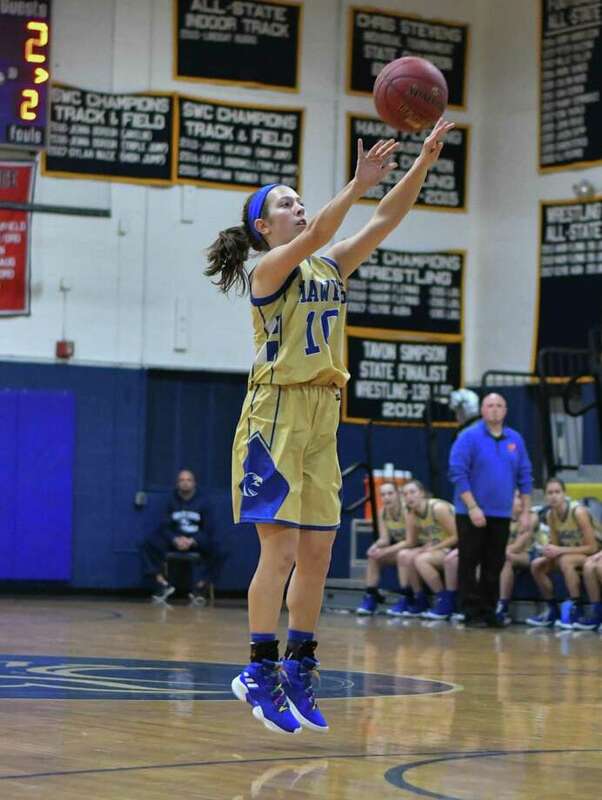 Cyleigh Wilson of the Newtown Nighthawks shoots a jump shot during a game against the Notre Dame Fairfield Lancers on Friday at Notre Dame Fairfield High School in Fairfield. About the only mishap between Newtown sisters Cailin and Cyleigh Wilson came at a very young age. During an elementary school basketball game Cailin bent over and tied her shoes ahead of a defensive possession. Only problem was the other was running right in her path, and Cyleigh careened to the hardwood. Other than that it’s been smooth sailing for the now Nighthawks stalwarts, especially over the last year and-a-half. The duo are two key pieces of Newtown’s 10-2 start to the season; the No. 6 ranked team in the GameTimeCT/Register Top 10 poll also went 17-3 a year ago with the Wilsons being components. Cailin, a senior, and Cyleigh, a junior, are more similar on the court than off it. It’s no coincidence that hoops was their path. The Wilsons moved from Indiana — a place where they know a thing or two about the sport — in second and third grade respectively. Both parents played in high school, too, before attending Purdue University. Cyleigh and Cailin were dribbling a ball as soon as they could walk. The sisters are part of a rotation that goes to the end of the bench for Newtown, one that has overwhelmed opponents so far this winter. Both are guards who shoot the ball from distance; Cyleigh has increased her role as facilitator due to the graduation of All-SWC point guard Rylee Mulligan. The pair have played on most youth and travel teams together, a time that will end following this season. Both plan on playing the sport in college. “I can’t put into words how much I’ve loved playing with my older sister,” Cyleigh said. “It’s so much fun; we know each other so well and to be able to see each other succeed is amazing,” Cailin said. As far as twins go, there couldn’t be better role models on and off the court than Rebecca and Rachel Gartner. A middle-school aged Susana and Sabrina Almeida watched from in close as the pair delivered Danbury three consecutive FCIAC titles from 2012-14. The Gartners left a permanent impact on the impressionable duo. Four years later and the now-seniors are trying to close their careers on as high a note as possible. Sabrina wears No. 4 and Susana No. 14; the pair were born April 14. The Almeidas have helped spark Danbury to nine straight wins after an 0-3 start, well on their way to surpassing last year’s win total of 10. The Hatters are third in the FCIAC and have hopes of cutting down the nets themselves. Like the Gartners, each has their own style of play and personality. Susanna is the sharpshooting point guard who facilities the offense while Sabrina can also knock down the 3-pointer and plays lock-down defense. They compliment each other off the court, too. Susanna stepped into Rachel’s shoes two years later as a freshman and has made the point guard position her own since becoming a full-time starter as a sophomore. Sabrina bided her time and was a full-time starter last season. And as far as being able to tell the twins apart. After spending their whole lives playing on the court, the two may head in separate directions after Hatters colors.